It sounds contradictory, yet it's true: You may need to avoid milk when you have diarrhea, but a milk product -- yogurt -- can help prevent it. Some differences among types of yogurt, such as whether it contains fruit, won't impact diarrhea. But a few factors are important. Greek yogurt is the best choice and, if possible, avoid brands with artificial sweeteners. Otherwise, the only thing that counts is whether your yogurt has live bacteria cultures. Some research shows mixed results, but most evidence from solid studies indicates that live bacteria, or probiotics, help prevent and reduce the duration of diarrhea, according to New York State University. A review published in the "Cochrane Database of Systematic Reviews" in May 2013 reported that probiotics effectively prevent diarrhea caused by bad bacteria. Yogurt producers use live bacteria to ferment milk, but after fermentation, it's usually put through heat processing, which kills the bacteria. Most manufacturers add live bacteria after processing, but some brands may not, so check the label to be sure. Live cultures must be listed in the ingredients, and most manufacturers voluntarily put the "Live and Active Cultures" seal on the container, notes the University of Florida IFAS Extension. Probiotics are live bacteria that contribute to your health by inhibiting the growth of bad bacteria in your intestines, supporting your immune system and aiding digestion, according to the University of Michigan. 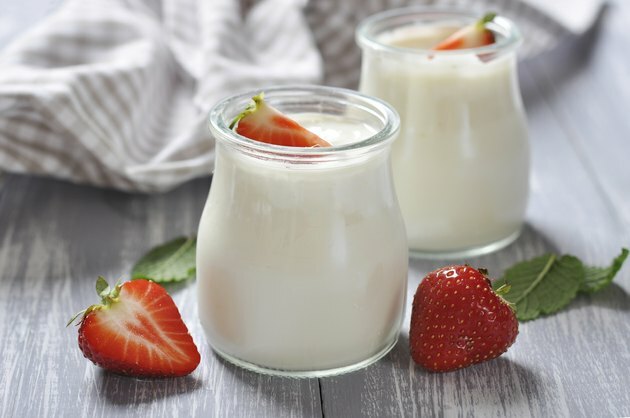 Many different types of probiotic bacteria are found in yogurt, but different strains of lactobacillus and bifidobacterium are most commonly used. You'll see names on the label such as Lactobacillus acidophilus and Bifidobacterium lactis. One type of probiotic that is especially effective for diarrhea is Lactobacillus rhamnosus GG, or more simply Lactobacillus GG. Some brands of yogurt contain this type of bacteria, according to Dartmouth-Hitchcock Norris Cotton Cancer Center. The natural sugar in milk -- lactose -- is the reason most milk products should be avoided if you have diarrhea. 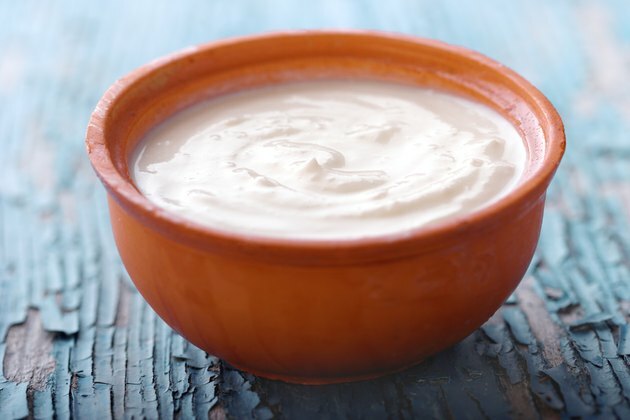 Diarrhea makes you temporarily intolerant to lactose, but yogurt may make you feel better more quickly, according to the National Digestive Disease Information Clearinghouse. Once again, the key is to choose brands that contain active and live cultures. These bacteria break down some lactose during fermentation, and they continue converting lactose to lactic acid in your intestines, so yogurt is well-tolerated. Greek yogurt is your best choice because it's strained to remove a large amount of lactose-containing liquid. Artificial sweeteners may have laxative effects, including diarrhea, bloating and gas. These unpleasant side effects are likely produced from byproducts left over as sweeteners are metabolized, which cause diarrhea by pulling extra water into your intestine. The sweeteners most likely to create problems are sugar alcohols and tagatose, which is made from lactose. 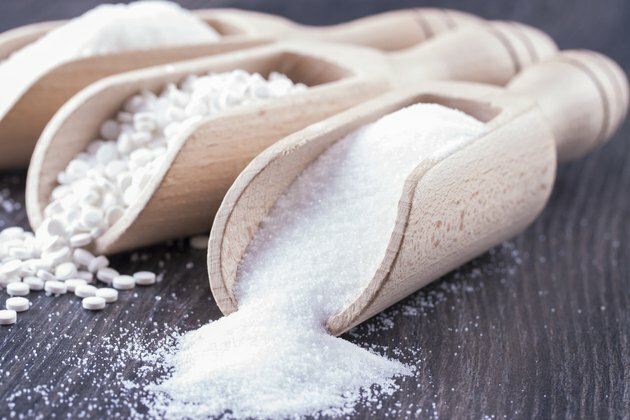 The most common sugar alcohols you'll see on the label include sorbitol, xylitol and manitol, but be aware that there are at least five others in the group: maltitol, lactitol, isomalt, erythritol and hydrogenated starch hydrolysates.